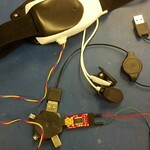 A couple of years ago, I bought a toy EEG reader: a Mattel MindFlex, one of several that use the same NeuroSky chipset. Toy it may be, the tech at its heart is really quite remarkable. I have a vague understanding of how it works, but that just makes it seem even more like magic. The NeuroSky module itself generates 9600 baud serial data. The MindFlex headset transmits wirelessly to a base station, but the data sent has been heavily munged; I assume this is because the transmitter module they use is slow but cheap. I hacked the hardware shortly after I got it (adding a little chassis-mounted 3-pin socket to access the chip’s serial output, the battery, and ground), but for one reason or another, I ended up forgetting about it until recently. So far, I’ve created a Python library for handling NeuroSky data; it’s on github now. I’ve also turned the headset into a Bluetooth device. I’ll post more about that later.